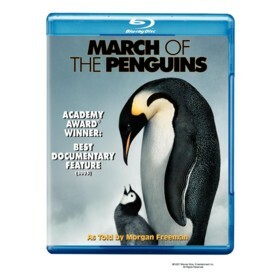 March of the Penguins is a Documentary movie starring Charles Berling, Morgan Freeman, and Romane Bohringer. The movie was directed by Luc Jacquet and released by the Bonne Pioche studio on 2005-01-21. The movie has an MPAA Rating of G (General). Our users found the overall impression of this film to be Educational. The movie's official site can be found at empereur.luc-jacquet.com/index_flash_ang.htm. I remember watching the preview for this movie many years ago, yet I only just managed to get around to watching it again, so I decided to write a review. This wonderful movie lets the viewers watch the daily struggles of the emperor penguin as they deal with arctic winds and the daily turmoils of life in order to procreate. While watching this movie you will enter a world in which the penguin is seen as the unlikely hero, and you will be enchanted by the wonders of the animal world. The movies plot centers around the journey of the emperor penguin in Antarctica as they travel to mate and procreate. You will watch in wonder as the males of the species struggle against the bitter cold and starvation in order to sit on their eggs until they hatch. You will see the mothers hunt for food and you will see how much these emperor penguins really care for each other. It really is a wonderful learning and visual experience. The movie is quite realistic as you will also be faced with watching a few sad moments as some of the penguin mothers, babies and even fathers die or are killed on their journey. I found this to be a welcome edition as it teaches children (and adults) that death is a part of life. The music and visuals are also excellent in this movie. National Geographic, Luc Jacquet, Michael Fessler and Bonne Pioche all came together to create a wonderful script and the ideal visual experience for anyone to enjoy. As I said the music is excellent, but I also really enjoyed the narration of Morgan Freeman. He is a wonderful actor and really created the correct mood with his amazing voice as he narrates the story.